When Shelley and I heard that hummingbirds were drawn to Penta plants we hurried out to buy two, potted them, and waited to see. Sure enough there was never a hummer far away from the star shaped bloom. Since then I have done several paintings with Pentas with “Choice Pentas” being my most recent release. 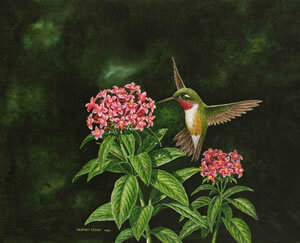 As is my custom there is a rebus type image of a hummingbird hidden in this painting. Yes, there is an obvious hummer but there is a hidden one as well. Enjoy your search in and around the flowers. “Choice Pentas” is part of the Essick Sharing Series. The prints are not for sale, cannot be purchased in the shop or on the internet. They are available only through a fund raising event.